Cologne - Millions of German football fans held their breath during the FIFA World Cup final. The last game of the quadrennial jamboree in Brazil developed into a genuine thriller, an end-to-end affair, before Mario Götze sent a nation into ecstasy with a poke of his left boot. However, the German public could have arguably enjoyed the game in a more relaxed fashion, because throughout the tournament, it was obvious that the Bundesliga would have the final say. 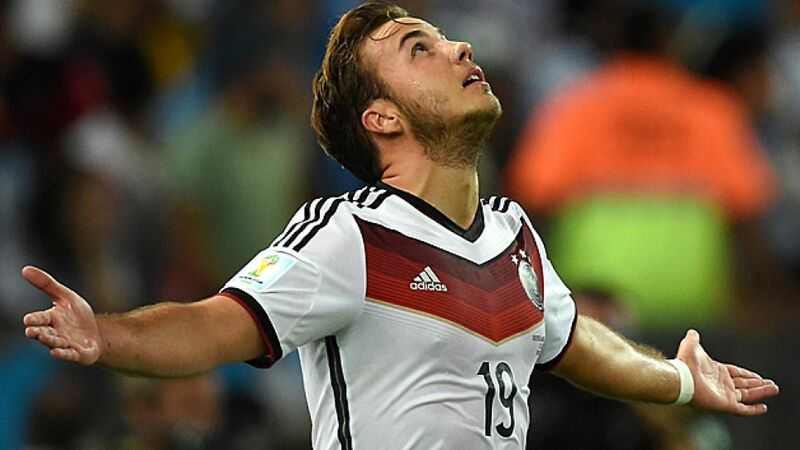 The last act of the 64-game showpiece event, Götze’s memorable winner, was also the last act of a competition which had been shaped by Germany's top flight. Go right back to the opening game and in typical fashion, VfL Wolfsburg’s Ivica Olic was worked whole-heartedly down Croatia’s left flank. It was the veteran's dangerous low cross which Brazil’s Marcelo unwittingly turned into his own net. The first goal of the tournament indelibly bore the mark of the Bundesliga, and it was a trend which would continue right through until the final strike of the tournament in Rio de Janeiro’s legendary Maracana stadium. In total, the Bundesliga’s stars scored 35 goals and assisted 30. The Premier League racked up 33, while players from Spain’s La Liga only hit the net on 24 occasions. The result was a World Cup full of goals which will live long in the memory. The last time the average number of goals in a tournament was as high as 2.67 was 1994 in the USA, and indeed, what set the Bundesliga professionals apart was their clinical finishing, requiring an average of just 6.9 shots per goal. In comparison, those plying their trade in Spain needed 9.9, while the Premier League representatives broke into double digits with 10.6 shots per goal. It’s no wonder then, that the Bundesliga averages 3.16 goals a game, higher than any of its European counterparts. Its stars are well versed in finding the back of the net. Players from FC Bayern München had a particularly impressive tournament, scoring on 18 separate occasions. No other club could come close to matching that figure, with FC Barcelona following the Bavarian giants in second with ten goals and Manchester United FC in third with nine. Indeed, with four goals to their names, Wolfsburg’s players ensured that they came eighth in the club goalscoring rankings. It wasn’t just net-busting records being set by Bayern players, either. Thomas Müller led the German team indefatigably and ran 83,957 metres throughout the tournament, more than any other player. Elsewhere, Arjen Robben's star shone bright, as he lead the Netherlands' to the semi-finals and, ultimately, third place all whilst completing 19 dribbles in the opposition penalty area, also a tournament-best. Mirroring their domestic form the German record-champions midfield dominated in multiple departments with Bastian Schweinsteiger winning the most one-on-one duels in the final, while Philipp Lahm played 562 successful passes, a tournament-leading figure. With Germany emerging triumphant, many experts are now prophesying the end of the Spanish dominance on the international stage, and with it, the beginning of the German era. A look into the past shows that such statements are fraught with hubris and risk. Indeed, after Germany’s last World Cup win in 1990, coach Franz Beckenauer predicted that “German football will be unbeatable for years to come”, but things turned out somewhat differently. This triumph, however, could prove to be more lasting. The Bundesliga is recognised worldwide for its outstanding production of young talent. Even in the Spaniards’ area of expertise, passing, did the Bundesliga leave all in its wake. A remarkable 86 per cent of passes played by Bundesliga players were accurate, whereas those from La Liga only clocked up an 83.5 per cent pass accuracy. In a profession defined by cyclical success, it would be unrealistic to expect this German side to be unbeatable for years to come. There are numerous foreign players now plying their trade within Germany’s borders, and using the experience gained to benefit their own national sides. A glance across the squads at this World Cup proves that with the likes of Robben, Kevin de Bruyne, Xherdan Shaqiri and Junior Diaz all impressing. However, Joachim Löw’s men had the final say, which was hardly a surprise. After all, there were nine Bundesliga players in their side as the final whistle blew against Argentina.